Premier Carts offers replacement retail grocery shopping cart child seat belts that meet ASTM F2372 specifications. These replacement child restraints meet all industry standards and government regulations and are designed to work with standard US retail shopping carts that meet ASTM F2372 specifications. 1 inch pictogram safety warning printed child seat belt to warn of dangers and prompt safe behavior. 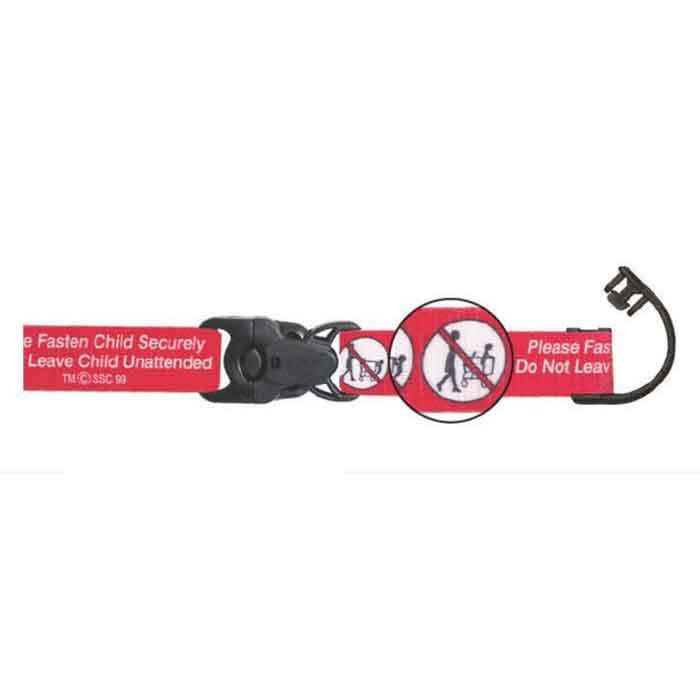 Child resistant buckle with Quick Click fasteners come pre-attached. The CRBPT individual quantities ship from our own inventory in Kansas approximately 1-3 business days after and order is received. Please add regular ground transit times (UPS or FedEx) to this 1-3 day processing time to estimate arrival times. The CRBPT package quantities ship from the manufacturer's warehouse in Florida approximately 1-3 business days after an order is received. Please add regular ground transit times (UPS or FedEx) to this 1-3 day processing time to estimate arrival times.